What is globalization? What affects it or drives it? What has changed in the global business environment? Is global business all light or are there dark sides to it as well? Where do we go from here? These are some of the questions that the book – Fundamentals of International Business – seeks to address. Co-authored by Michael Czinkota and Ilkka Ronkainen of Georgetown University and Michael Moffett of Thunderbird, Fundamentals of International Business gives a comprehensive overview and introduction to international business for both undergraduate and graduate students. The book discusses the core issues and pillars affecting the internationalization and analyzes the processes involved in corporate decision making. It provides students with invaluable insights by incorporating worldwide examples, trends, and data rather than relying on U.S.-based information alone. Fundamentals of International Business uses an integrated learning system to structure the text and the teaching supplements around learning outcomes. An opening vignette sets the stage for each chapter and includes one or two questions for consideration. The book provides fast facts, cultural clues, and an extensive glossary as well. Each chapter also contains two or three Internet exercises to offer hands-on experience. 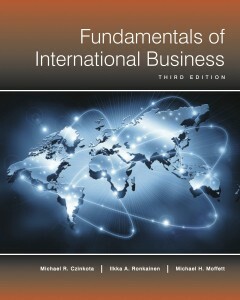 The book should be required reading for all those interested in learning about international business. It can be obtained from Amazon.com.